Creating a website today means you have to think about more than just your content. Social media sharing is everything in today's world of marketing. Creating content that your customers want to share is only half the battle, it's even more important to make sure you've created content that is shareable and that your website makes it easy for content to be easily shared on all social media channels. When you build your website make sure that the platform and the design encourages users to share your content on their favorite social media channels. Include sharing buttons on every page of your website. Even if you're building a free website or choosing to go with a more budget-friendly host there are services available that will still meet your needs. Consider using a service like Wix that offers hundreds of templates to choose from so you can find one that suits your taste, your business and also offers customers easy sharing options. Choose a layout that compliments not only your business, but is also pleasing to the eye so that customers are more likely to stay on your site longer. This will help them find what they're looking for and encourage them to share what they find. Include relevant images with all of your content. No matter what the content is, it needs an image. No exceptions! Images mean clicks and shares on social media. Creating relevant images is easy with tools like Canva and PicMonkey, so don't worry if you don't have amazing photo editing skills. Make sure to include your brand name on each image. Infographics are easily shareable on social media platforms like Pinterest and Facebook. Creating an infographic that represents your brand will almost guarantee instant shareability. Be sure to include these graphics with content where appropriate, whether on your corporate blog or on a page dedicated to the point of the infographics. Feature your own social media channels prominently on your website. Repetition is key, don't just have your profiles linked on your homepage, have them follow your customers as they browse your site. Also be sure to include links to all of your company's social media accounts in any email communications that you send out. Make sure that your settings are right so that each time your brand is shared by customers your profile receives a notification. This will enable you to engage with your customers right where they're talking about your brand. It will also elevate your social media reach, so it's a win-win situation. 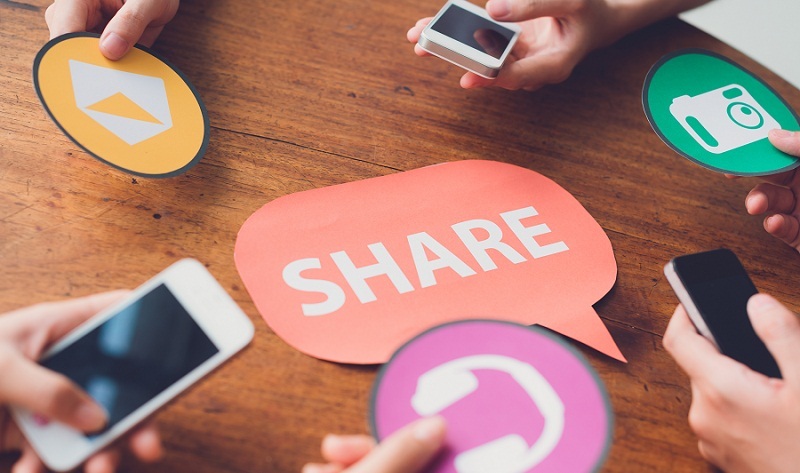 Share your own items on social media in a way that encourages customers to re-share and engage. Invite comments, ignite conversation and respond to users who comment. When customers leave positive (or negative) comments respond in a positive way. Explain why your policy is the way it is, explain how an item works, or thank them for their compliments.